Karaite writer and bibliographer; born at Lutsk at the end of the seventeenth century; died, according to Firkovich, at Chufut-Kale, Crimea, or, according to another source, at Lutsk, March, 1766. 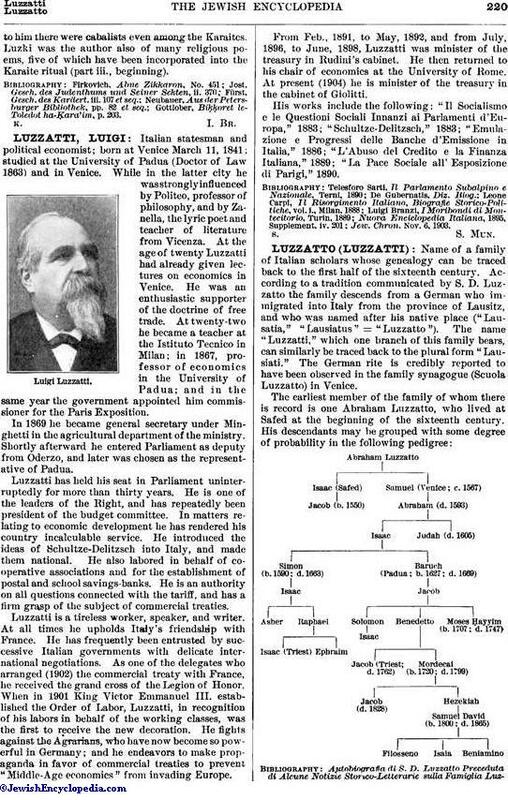 He was well versed in rabbinical literature and was also a diligent student of Cabala. An indefatigable and able copyist, he went in 1751 to Chufut-Kale, where there was a flourishing Karaite community which possessed a rich library of Karaite manuscripts. He was received into the house of the Karaite writer Mordecai ben Berakah Yerushalmi, and succeeded Samuel Ḳala'i as teacher of the bet ha-midrash at Chufut-Kale. Luzki rendered great services to Karaite literature both as copyist and as writer. To his labors are due the preservation of many valuable works; and his book on bibliography (see below), although sometimes lacking critical sense, became an indispensable guide to the student of ancient Karaite literature. The following are Luzki's works in the chronological order of their composition, as given by himself in his "Oraḥ Ẓaddiḳim": "Be'er Yiẓḥaḳ," commentary on Judah Gibbor's " Minḥat Yehudah" on the Pentateuch; "Siaḥ Yiẓḥaḳ," commentary on the prayer for the Day of Atonement; "Reshit Ḥokmah," commentary in three volumes on the daily prayers; "Me'irat 'Enayim," code in two volumes, of which the first, entitled "Ner Miẓwah," comprises the Commandments and their explanations, and the second, entitled "Ner Ẓaddiḳim," enumerates the differences between the Rabbinites and the Karaites and gives a genealogy of the Karaite scholars and a list of their works; "Sha'are Ẓedeḳ," on the calendar; "'Aḳedat Yiẓḥaḳ," on the laws concerning the slaughtering of animals, and on the ten Karaite articles of belief; "Kebod Elohim," commentary on Joseph ben Mordecai Troki's mystic prayer "Ha-Elef Leka"; "Arba' Yesodot," on the four dogmatic principles, namely, the creation of the world, the existence of an invisible God, His holiness and spirituality, and His unity; "Tefillah le-Mosheh," questions and answers exchanged between God and Moses; "Halikot 'Olam," description of the creation of the world and of the nature of all things according to their quantitative and qualitative attributes; "'Ene Yiẓḥaḳ," commentary on Elijah Bashyaẓi's calendric tables; "Toledot Yiẓḥaḳ," religious poems, enigmas, letters, etc., in two volumes; "Ṭure Zahab u-Neḳuddot ha-Kesef," on the precepts, in two volumes, of which the first, "Ṭure Zahab," enumerates in verse all the precepts, arranged in the order of the 620 letters of the Decalogue; the second, "Neḳuddot Kesef," being a commentary thereon; "Sefer Bereshit," a mystic explanation of the Creation; "Rekeb Elohim," on the mysteries of the Divine Chariot; "Kebod Melakim," a mystic explanation of the letters of the Hebrew alphabet; "Sefer ha-Tappuaḥ," on the Creation and on the Divine Chariot, according to the modern Cabala; "Libnat ha-Sappir," on the ten Sefirot. 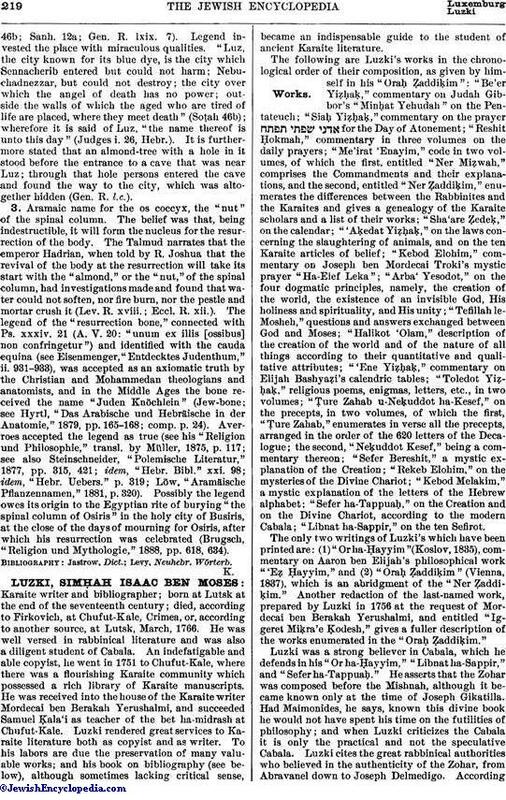 The only two writings of Luzki's which have been printed are: (1) "Or ha-Ḥayyim" (Koslov, 1835), commentary on Aaron ben Elijah's philosophical work "'Eẓ Ḥayyim," and (2) "Oraḥ. Ẓaddiḳim" (Vienna, 1837), which is an abridgment of the "Ner Ẓaddiḳim." Another redaction of the last-named work, prepared by Luzki in 1756 at the request of Mordecai ben Berakah Yerushalmi, and entitled "Iggeret Miḳra'e Ḳodesh," gives a fuller description of the works enumerated in the "Oraḥ Ẓaddiḳim." Luzki was a strong believer in Cabala, which he defends in his "Or ha-Ḥayyim," "Libnat ha-Sappir," and "Sefer ha-Tappuaḥ." He asserts that the Zohar was composed before the Mishnah, although it became known only at the time of Joseph Gikatilla. Had Maimonides, he says, known this divine book he would not have spent his time on the futilities of philosophy; and when Luzki criticizes the Cabala it is only the practical and not the speculative Cabala. Luzki cites the great rabbinical authorities who believed in the authenticity of the Zohar, from Abravanel down to Joseph Delmedigo. Accordingto him there were cabalists even among the Karaites. Luzki was the author also of many religious poems, five of which have been incorporated into the Karaite ritual (part iii., beginning). Gottlober, Biḳḳoret le-Toledot ha-Ḳara'im, p. 203.